To design its LA arts space, located on North Camden Drive near the corner of Wilshire Boulevard, Christie’s engaged wHY, the interdisciplinary design team known for collaborating with important local cultural clients, such as the Marciano Art Foundation, CalArts, and Los Angeles County Museum of Art, as well as top artists and collectors. wHY’s design for Christie’s wraps the two-story, street-level space with an undulating curtain of pearlescent white aluminum, creating an elegant and timeless exterior that speaks to the history and quality of the company’s 250-year old brand. Inside the new space, wHY designed a grand yet flexible layout for Christie’s to host exhibitions, social events, educational programming, and live-streams of auctions taking place in Christie’s salerooms worldwide. The upstairs has been designed to include private meeting areas and offices where clients and specialists can discuss appraisals, advisory projects, or buying and selling opportunities. A 1,400 square-foot addition on the second level creates a unique open space with greenery that can double as programmable outdoor event space. 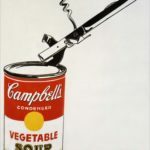 Can a Soup Can Open Up the Warhol Market?